I’m currently on the road and just had an opportunity to dine out at a fantastic local breakfast spot. After placing my order and being told my total, I whipped out my Chase Freedom card, at which point I was informed of a $0.40 charge for using a credit card. I was annoyed, but I was in a hurry and wanted to conserve my cash, so I had them go ahead and run my card. I also rationalized that, with the 5% bonus rewards on restaurants, it would end up being a push vs. using cash. Chase Freedom offers 5% cash back on up to $1, 500 spent in categories that change every three months as long as you remember to enroll each quarter. A checkout fee, or payment card surcharge, is an unfair surprise fee that a retailer tacks onto a consumer’s bill when he or she uses a credit or debit card. Visa rules do not allow retailers to charge cardholders a checkout fee for using their cards, mirroring laws in 10 U.S. states. In other words, not only does Visa not allow this practice amongst their merchants, but 10 states have actually outlawed such fees. And guess what? The state I’m in is amongst those that don’t allow it. While this bugged me, it really wasn’t a big enough deal for me to pursue. But if I wanted to follow up on this, I could report them to Visa as well as to the state attorney general’s office. Will I bother? Probably not — it’s just not worth the time involved. Interestingly, merchants can offer a discount for using cash or checks without running afoul of the rules. While this really seems like two sides of the same coin, the difference is that the merchant would have to advertise a higher price and then discount down from there. I’m guessing that most merchants would prefer to offer a lower price so as to appear more competitive, and then tack on a fee. What do you think? Should merchants be allowed to tack on a credit card fee? How would you handle it if they did? Would you use your card and move on? Use a different form of payment? Go somewhere else? Report them? Let us know in the comments. Merchants have been dealing with credit card fee’s forever. It’s part of the cost of accepting a credit card. I use credit cards because it’s convenient, and I never have to worry about having enough cash with me. Who wants to walk around with large amounts of cash? I would probably choose not to do business where I am being charged a fee for using my credit card. Seems like gas stations started charging more for using credit cards (call it what you want … but, consumer pays more for using credit cards at most gas stations) and I just stopped going to gas stations that do that. I believe that merchants will loose business if they charge more for using a credit card. What do you call this?An eye surgeon states the operation will cost $5400 cash. Paying by Visa will cost 20 % more. Is there a name for this? Unethical? Do I report this to Visa or to whom? I think it’s very unbecoming for a doctor to act this way. I agree with Ben. My fees went fromm $400/mo to $600/mo for accepting CC. When I see someone pull plastic from their wallets, I feel like they just pulled out a gun. I have a small pharmacy and can not increase my prices to accomodate the CC fees/surcharges when they go up. Do you know there is a penalty for accepting a charge or $15.00. The 3 surcharges amount to $1.42 for a $15 charge. You do the math. The only people who are getting richer are the CC processers. Most consumers have little idea of how much businesses actually pay in processing fees. For example, all of those frequent flyer miles and cash back rewards that consumers enjoy are funded in part by small businesses through higher transaction costs. Saying that small business have a choice whether or not to accept credit cards is like saying that you have a choice whether or not to breath. It’s a choice, but the outcome in both situations is easily predictable. Allowing merchants to impose convenience fees on credit and debit card transactions would ultimately lead to lower interchange fees for businesses as a result of increased competition from cash payments. It was Visa, not me, who framed the matter as one of fairness: “an unfair surprise fee that a retailer tacks onto a consumer’s bill.” But what makes one fee fair and another unfair? I would argue that the merchant agreement is itself unfair, and negotiated under conditions not far from duress. And about that “tacked on” part: being tacked on makes it visible, and the comments here show how people react to visible fees. Visa’s own fees are never tacked on: they’re carefully hidden so that card users can pretend they aren’t there. It’s not a matter of fairness. Businesses don’t have to accept Visa cards. Visa just requires that you don’t charge their customers extra if your business agrees to accept Visa cards. I love the way Visa uses the emotionally charged word “unfair”. What’s really unfair is making everyone pay more to cover the costs for the people who want the extra convenience of using a credit card. Visa doesn’t want you to see it that way, naturally. Iâ€™ve reported a salon I went to for the first time. They never mentioned this fee when I booked the appointment. There was no sign posted. It was only AFTER Iâ€™d received service and went to pay that I was told I would be charged 3% to pay by credit card. I donâ€™t often carry my checkbook with me, and I certainly didnâ€™t have enough cash. For some odd reason, I happened to have my checkbook, so I paid by check. I would have been highly annoyed if I had to pay the surcharge. I didnâ€™t know this was against the rules until later. When I found out, I reported the business. I donâ€™t patronize this salon anymore, but I did notice a big sign out front saying cash/check only. I think their credit privileges were either revoked, or the business owner made a decision to stop accepting credit. Iâ€™m not sure Iâ€™m against a business being able to charge extra for credit. But they need to be EXTRA clear about this so no surprises. Have you considered informing the merchant that they are violating the law? Maybe they just didn’t know about it. I wonder how places that do charge an extra fee (e.g. the IRS) get around the contract and/or laws. I have no problem with vendors charging me fees that more accurately reflect the costs I impose on them by my choices. It’s simply an internalization of a cost, and enables me to make better choices. Win-win! The other option would be for the cost to stay externalized, and I would be forced to pay that cost regardless – even based on the choices of other patrons of that vendor, whom I cannot control. I think the ban on surcharges (both state laws and credit card network rules) should be banned. 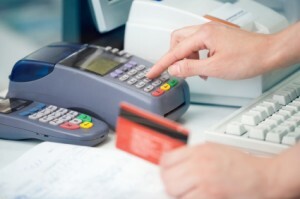 Choosing how to pay has a direct impact on the merchant’s bottom line. It’s only fair to give the merchants some influence over that decision in addition to credit card issuing banks. The competing influence from both the merchants and the banks will push the payment method toward to lowest cost and most efficient option. Right now the merchant fees act as a tax. All consumers pay it. Some get a portion of it back as rewards. It would benefit everybody except the banks if the payment method gravitates to the lowest cost one. You should definitely alert VISA. Yes it’s a small figure, but if it’s illegal, they should not be doing it. These merchants are easily making extra money on top of the profits from the items they sell. If they’re going to charge me extra, they should make it clear up front. Don’t add it on and hope that I don’t notice. The vendors get surplus business as statistics show that people buy about 15% than they would if they were not to use credit cards. The <5% cc fee is a fraction of that surplus. The credit card companies also lose out as they would lose 100% of the business for folks who start using cash. The only winner would be the consumer who would buy less. Ironically the law would appear to be penalizing the consumer so many will not sign on. Thus, this is one law which will not be popular with anyone. however, there is nothing stopping the consumer from voluntarily converting over to cash! I report these violations EVERY time but the fees remain at the stores to this day. I make a complaint to the person accepting the payment and they waive it every time. I’m a small business owner and don’t like losing a part of my fee to these fees either; however, I knew what I was getting into when I decided to start accepting MC/Visa. I think merchants should be allowed to have extra fees for use of credit cards. I’m not sure why the state governments would outlaw that. However the fees should be clearly posted not slapped on at the end of a purchase as surprise. As it is, that fee is against Visa rules so the merchant shouldn’t do it of course. Yes, please report the merchant to your credit card company, to Visa, and to the state’s Consumer protection agency or Attorney General office. 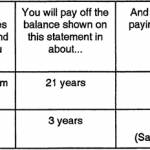 You may consider filing a chargeback for the purchase at the breakfast merchant; and provide them the reason. Plus, it sounds like the merchant did not disclose this either. It sounds like you got ripped off, and not caring…all because it’s 40cents. You, the consumer, should not pay a fee for them to run their own business, cause you could have went elsewhere, or to another place that doesnt charge fee. I’d definitely report it, at least to Visa. First, it’s against their merchant rules, but it’s also against the law in that state. If it was legal, and allowable by Visa, I’d still file a complaint with Visa that the merchant didn’t disclose the fee upfront. Arco gas stations charge a fee for using a debit card but there’s a notice right up front on the pump, plus you have to accept the fee on the pinpad, so there are no surprises. Honestly? It’s just one more reason we don’t use credit cards (Dave Ramsey follower checking). I’ve been on both sides; how is a small business owner supposed to stay profitable with small purchases? The entire profit can get swallowed by the transaction fee. Just report it to Visa at least. It takes a few minutes and easy to do online. Certainly I would report it to both VISA and the state AG. Little or big, a wrong is a wrong, which should be reported. Unless it somehow shows up separately on your bill, it may not be as easy to dispute, but I would consider doing that too. It is not really the $.40, it is the example it sets. I know it is a big PITA but I would take the time to report it. You can do a single letter in word and send it to both the state AG & Visa. If the merchant gets away with this modest fee this week it ciould be $1 nest week and $5 next month. I would also dispute the charge when it hits your bill as you are being forced to pay for an illegal service. Every transaction is a contract for transparency and honesty. From servers not stating the upcharge for a side or hidden transaction fees, it’s all wrong. You were charged exactly forty because that’s the paint point most consumers will endure begrudgingly. You would be the exception to report, but consider how many other consumers would not have to deal with such non-sense. Report them and be a consumer hero! I would take the time to notify Visa. Accepting Visa/MC is a privilege (albeit by contract) which brings in more customers. What’s next, charging me an extra quarter because I happened to see the merchant’s advertisement in the paper? These merchant costs are considered overhead and should be figured into the sales price, not tacked on at the last minute. When I go to a local establishment, I try to pay cash. It is much more valuable to me to have them open and profitable then to get a small amount of cash back for breakfast. That being said, if I had used my credit card, I would have probably swallowed the 0.40 and not said anything. I am all for companies being able to profit that is what capitalism in America is all about but when they turn record profits and if it stick it to main street it becomes nauseating. I don’t know how much your breakfast cost, but let’s say if it was $10, then your 5% reward would be $0.50. So most of that is wiped out by the $0.40 surcharge.